Have you all been over to Help Kidz Learn lately? They have three fun new SWITCH activities! 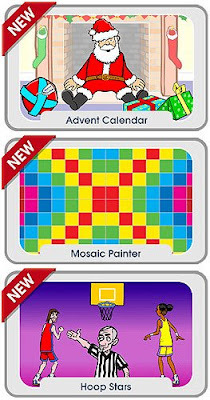 I have been using the Advent Calendar in morning meeting and this afternoon spent some time playing with the Mosaic Painter (a great way to teach mouse cross scanning) and Hoop Stars. Hoop Stars, even set to "easy" had a bit of a challenge. Tip - you have to wait for your player to aim before you "shoot" (hit the switch).